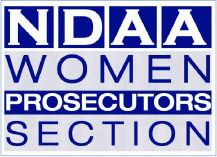 The Women Prosecutors Section is open to all members of the NDAA. The Chair of the Committee is District Attorney Jackie Lacey of Los Angeles County, California. A network of NDAA members committed to leadership, mentorship, and friendship by women prosecutors. Providing education and promoting increased opportunities for women seeking leadership positions within prosecution offices. Assisting NDAA in public engagement and eduction on issues of particular importantance to women prosecutors. An annual banquet and speaker program.